July | 2008 | Two cultures, one mind. I appear to not be the only person who’s concerned about the lack of communication, or delivery of Elonex’s sub-notebook. elonex onet anyone got one? I’m trying to give Elonex the benefit of the doubt, but confidence is faltering. I am away again next week, but if I’ve not received anything by my return, I will be contacting the suppliers (the mysterious dslshop) and asking for a full refund. I’ve opened comments on this thread, maybe if someone from Elonex is willing to post a reply, they could do so here – same if anyone has received a ONE/ONEt. I’ve lectured on outsourcing in the past, and one of the problems which I have is trying to explain the difference between outsourcing and sub-contracting, or simply obtaining services. The defintion which I finally decided on is that outsourcing is concerned with employing other people to do work which you (or your organisation) could do yourself, but choose not too. Of course, the reason why you choose you outsource as a business is varied. Some of the reasons given are ‘to focus on your core business’. This is was BT did at the end of the nineties, when they outsourced much of their building support and maintenance (including phone box cleaning). Of course whole industries have been built around outsourcing. This all came back to me recently, because I’ve been gradually outsourcing chunks of my life. I gave up cleaning my car years ago, when I realised that I could pay a machine, and latterly someone to clean it for me and they would do a much better job than I could. DIY is now something that I look on with great interest and make the tea for – if anyone asks I tell them that I’m the ‘ideas’ person. I’ve now taken the next step at home, and every fortnight two ladies (they are invariably female), come and make a better job of cleaning my house than I ever could. At their recommendation I ensure that I’m out whenever they arrive, all I have to do is leave them the cheque. I’ve gone with a national franchise, so here’s an unsolicited endorsement for Molly Maid. If they don’t do your area, then there is an alternative national franchise, Merry Maids which you may want to check. Meanwhile, in other news, I’ve decided to close down my old ‘personal’ website, and http://www.andyhollyhead.co.uk now redirects here. I’ll be adding some pages to this site with some of the information which was on my old site, which had done me well for three years, but times move on. The original title of this blog reflected that originally I was intending to compare and contrast the working and teaching of my ‘day job’ with that of my ‘evening’ job, i.e. lecturer in a post-92 university, and the Open University. Times move on, and over the last 20 months the blog has evolved. Much less about my day to day work, more about technology and the challenges of being a some-time web worker. I received confirmation whilst I was away that my request to take a one year sabbatical from the Open Unviersity has been approved. This means that I will not be tutoring my two courses (T320/T324) for their 2009 presentation. I can still be involved in staff development and open events, but there will be no tutoring. I have the option if I wish to return in 2010, subject of course to student numbers. So from October, I will be ‘one culture, one mind’ – but I don’t think I’ll change the title of the blog. Why have I done this? I’ve tutored with the Open University for nine years, across four very different courses. It’s given me a really wide breadth of teaching diverse students. Taking this year out will provide the chance to see if there’s something else which I can do with the time. I’ve already entered two creative writing competitions this month, and have another prepared, just need to find time for the final edit. And I’m still studying Advanced Creative Writing starting September, so we’ll see where that leads. iPhone upgrade – o2 Computer Says No! “You seem to be very excited by the iPhone!” the o2 salesperson said as we sat down in store. “Err.. yes”. OK, I don’t need an iPhone, but it’s cool, and the initial hubbub seems to have died down. Also this application looks so cool. I was still surprised though when they had the iPhone instore at Perry Barr. The usual security checks went through, then the screen flashed (metaphorically) red. “Computer says you’re not eligible for an upgrade”. “Ah, But I am” – producing with a flourish the email from o2 saying that I was entitled to upgrade to iPhone (see, I’d done my work). Hmmm.. Assistant Manager looks at email – “How do we know this came from o2?”. The email address at the start of the email could be a clue. “We’ll ring them”. They do, and they confirm that whilst they sent the email, and a text message to me saying I was entitled to the upgrade, in fact this was only through online or over the phone. But of course, there’s no iPhones available online or over the phone. But, I could buy a new iPhone on a new contract with a new number. I could also cancel my old contract, but not transfer my o2 number from one o2 phone to another (they could confirm I could transfer my o2 number to Orange, then back from Orange to o2 iPhone!). I could have any number of free upgrades over the phone, but not to the iPhone, as they didn’t have any available.. only in stores. “OK, when can I upgrade in store”. So in two weeks and two days time I can go back to an o2 store. What’s the betting they won’t have any in stock. Though I had my mobile broadband modem, I was not able to use it anywhere which we were on holiday, without standing in the middle of a field with cows (and their ‘leavings’). It wasn’t just checking email (and this blog) I missed, but general access to weather, news, and things like the prices and opening times of local attractions. Still, it’s proved I can live without the Internet, honest. I’ve got ideas for a few postings, and I’m still awaiting the delivery of the Elonex OneT which has produced a huge amount of interest in this blog (and some interesting comments in the associated posting). I’m ‘live blogging’ from Shrewsbury, where I’m helping out at an Open University event. So far, just an hour in, it’s been very quiet for me though. The MacBook and mobile broadband modem however are working well together, and I’m updating myself on what’s happened OU wise over the last few weeks, whilst I’ve been buried in marking and on holidays. 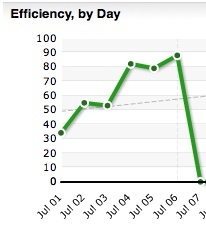 Yesterday’s post about tne Elonex ONEt created a real stir, with over six hundred hits in one day – considering this blog took 130 days to get to 500 hits in early 2007, it’s made all of my stat graphs look like very steep ski jumps. Thanks everyone. The Register did pick up the information, all be it still providing some inaccuracies re: pricing which have been corrected in the comments. It’s pretty clear that the ONEt is a rebadged/repackaged Alpha 400 on steroids, the nicest pictures here at The Reg article. It looks like they’ve built in wi-fi, though the changes of it being 802.11n I guess is zero. There will be no posting for a while now as I go on my Summer holidays tomorrow. Technology will be with me, but the definition of a holiday is doing something different whilst away. Friends at work had started receiving emails about their Elonex One delivery, I was getting just a little jumpy here, as I’d ordered the One on the day of announcement directly from the Education Show. So I contacted Elonex, and had a response back literally within minutes. After putting my order details in, I was made an offer which I couldn’t refuse – an Elonex ONEt for the same price at my original Elonex ONE. Details of the ONEt are not available from the main ElonexOne page, but are here! Click on the icons for more details. There’s two models, ONEt and ONEt+, the only difference is the internal memory (there doesn’t appear to be a BlueTooth option on the ONEt+, which there was on the original plus). This is clearly a completely new machine, not the ‘photo frame plus keyboard’ which the Original One appeared to be, though losing some of the associated innovations. The processor spec is improved, and importantly for me appears to be beefed up enough to be able to play videos. According to the blurb associated with the order email, the ONEt/+ should retail at £179/£199, so I felt flush enough to buy the ONEt+, Neoprene Case (£10), plus the £10 shipping already paid, total £139. They need to check their wording however on the credit/debit card details page – as its written you appear to be setting up a monthly payment (which clearly you’re not!). I’ve risked opening comments on this posting, as through the stats I know that there are a few people following this. Let’s see who’s first to receive their machine! 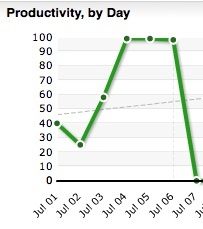 The blip on Wednesday was due to me not running the software at work, following PC problems. 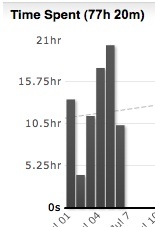 RescueTime can become addictive. I don’t think I’ll run it all the time, but it’s useful when you think that you’ve ‘done nothing all day’ exactly what you have done in this format. All the categories have been allocated by RescueTime, the only thing I’ve done is state which are more or less productive on a scale from -2 to +2, so for example time Word Processing is more productive than writing emails, which is more productive than reading blogs etc. 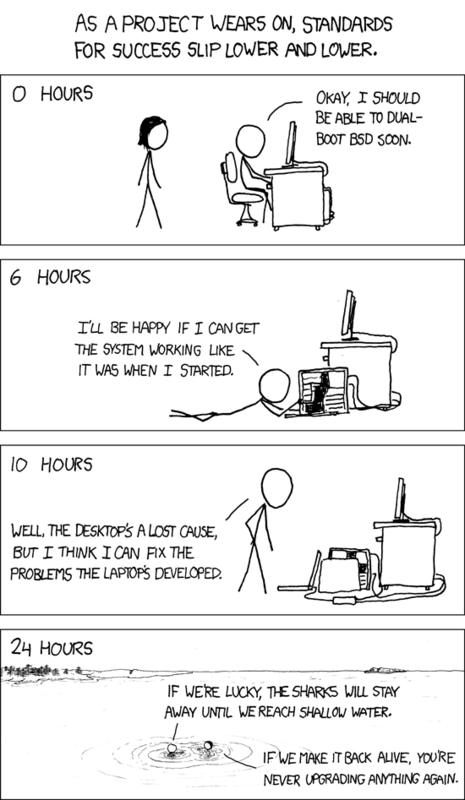 But 77 hours since Tuesday sat in front of a PC. Not good. Looking forward to my holidays now. We all know this feeling don’t we? Must remember this for my next project management lecture. I’m working hard marking Open University assignments. There’s some consolation to doing this now – at least my productivity stats on RescueTime have increased – at midnight last night they were up to over 85%! The marking is going a little easier than before, and I’ve got feedback down to a fine art. Just a quick note about using parallels. I’m finding that using Windows as a full window using ‘spaces’ provides the easiest experience for me. I have my ‘mac’ view for surfing, looking at the marking scheme and ‘distractions’ (such as this blog), then Alt-Right Arrow and I’m in windows, with eTMA, Open Office and notepad for scratchpad type items. One of my simple motivation techniques is to note the time that I complete each marking, so I know roughly how long each one takes (and where I timewaste too!). Talking of which, better get on – fifteen more to do this weekend.